Escape and recharge with a visit to one of Iowa’s premier full-service day spas, The Spa at West Glen. Once you enter, you’ll be whisked away from the hustle and bustle and transported to a relaxing, soothing oasis for your mind and body. Our expert staff will personalize your relaxing and healing treatments with the best techniques and products from around the world. We’re devoted to making you feel less stressed, so indulge in some much deserved ‘me time’. Relax your mind while you reinvigorate your skin. 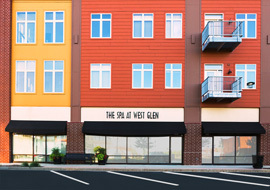 The Spa at West Glen is one of West Des Moines’s premier full-service day spas, offering a variety of face and body treatments to supplement your at-home beauty regimen and provide some extra pampering. Our trained aestheticians use proven products and techniques to nourish your skin and relax your mind, and our medical staff administers trusted treatments including injectable fillers and BOTOX® Cosmetic. Treat yourself to a service at The Spa at West Glen, and let us be your partners in health and beauty. Whether it is a girls’ day out or a time to reconnect with your significant other, the Spa’s massages are the perfect chance to create a lasting memory. Your wellness is more than skin deep. Nutrition and healthy habits are a key to a living well. Our registered and licensed dietitian, Jessica Schroeder will work with you to create a healthy and sustainable life style. You owe it to yourself to get away. Contact us today to schedule your spa day.